Grab a friend and head to participating Starbucks between May 3 and May 12 from 3-5 pm for the Frappuccino Happy Hour. 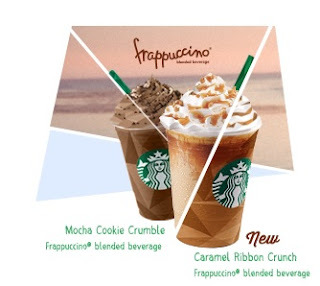 Choose from a Frappuccino on the menu or create you own custom version. Try the new Caramel Ribbon Crunch Frappuccino. Oh. My. God. I had a sample this morning, and it was DELISH!! Whatever suits your fancy. Just be there or be square!